Things are changing for U.S. nautical charts. We think you’re really going to like this improvement! Last week, Coast Survey announced that most of our nautical charts are available for free download as PDFs (Adobe Portable Document Format). Before that, we announced that the government will stop printing lithographic nautical charts after April 13, but chart users can still get printed charts from a NOAA-certified Print-on-Demand chart provider. 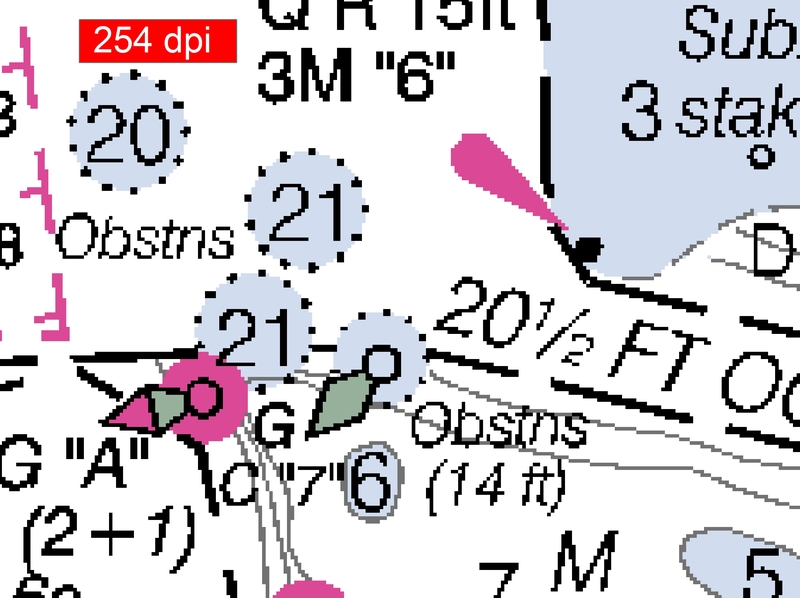 Today, we have good news for boaters with electronic charting systems that use NOAA raster navigational charts (NOAA RNC®): your charts are going to be easier to read. The NOAA RNC is a geo-referenced digital image of the traditional paper chart. When it comes to digital graphics, higher resolution is generally better than lower resolution. Dots per inch (dpi) measures the image resolution: the higher the dpi, the better the resolution, the clearer the image. Today, cartographers at Coast Survey are busy improving the resolution of NOAA RNCs, increasing the chart images from the current 254 dpi to 400 dpi. This change improves the clarity, readability, and aesthetics of this highly popular digital charting product. Coast Survey maintains over a thousand RNCs that are available as free downloads. Our Marine Chart Division is transitioning the entire suite, updating and checking quality on all the charts, and we expect all RNCs to be upgraded to the 400 dpi by January 2014. Don’t worry, we aren’t taking anything offline. You won’t even notice that we’re changing the RNCs, except that you’ll see clearer images after your chart has been changed to 400 dpi. 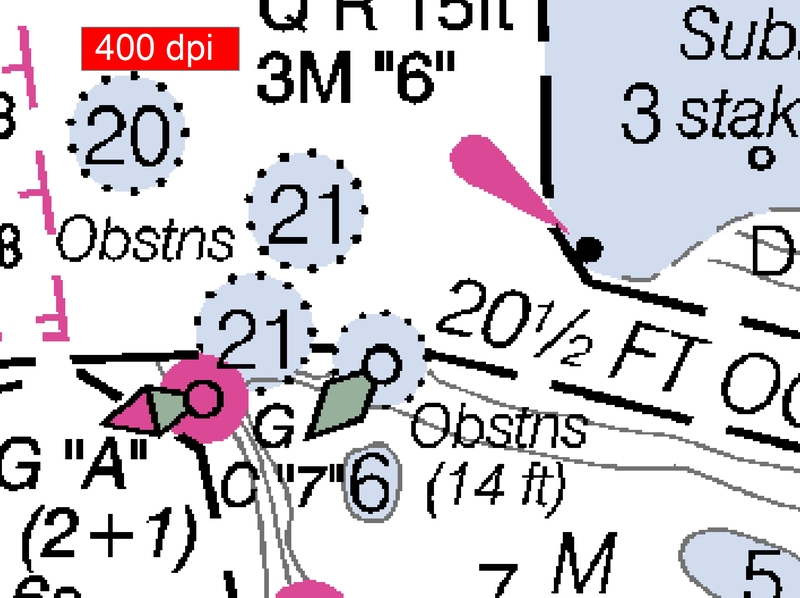 This improvement in RNC clarity will make it easier and faster for mariners to interpret the information on the chart. Less time puzzling through ragged graphics means more time to increase situational awareness. We’ve included a 400 dpi test dataset on the NOAA RNC webpage, so RNC users can give it a try. The test dataset includes BSBs for Detroit, Long Island Sound, Puget Sound, and Tampa Bay. FAQs : We’ve listed some frequently asked questions below. Does this change the actual format of the RNC? No. The only change is the resolution of the chart image. Will higher resolution files have bigger file sizes? The average increase in file size is around 50 percent, but that is easily handled by today’s computers, mobile apps, and display systems. When will all the high-resolution RNCs be available for public download? If the transition goes as planned, NOAA expects to upgrade all RNCs to 400 dpi by the end of 2013. I currently use the NOAA RNC suite in my chart plotter. Will the high-resolution RNCs work as well? We expect no compatibility issues in this upgrade. If you do have technical problems with this upgrade, contact your software provider for technical assistance. We encourage software providers to let us know of any difficulties during the testing period. Submit comments and questions to NOAA’s Nautical Inquiry & Comment System.